engagement initiative investigating the power of the fossil fuel industry. The CMP is jointly led by the University of Victoria, Canadian Centre for Policy Alternatives and the Parkland Institute. The CMP is funded primarily by the Social Science and Humanities Research Council (SSHRC). In our home country of Canada, the disparity between climate rhetoric and practice was recently pushed into the spotlight when Prime Minister Justin Trudeau – an avowed climate champion – purchased on behalf of Canada an unfinished bitumen pipeline from Houston-based corporation Kinder-Morgan. The construction and operation of this pipeline will contribute to a planned increase in oil and gas extraction that will blow Canada’s already-weak Paris commitments out of the water. This has led to some head-scratching in Canada. 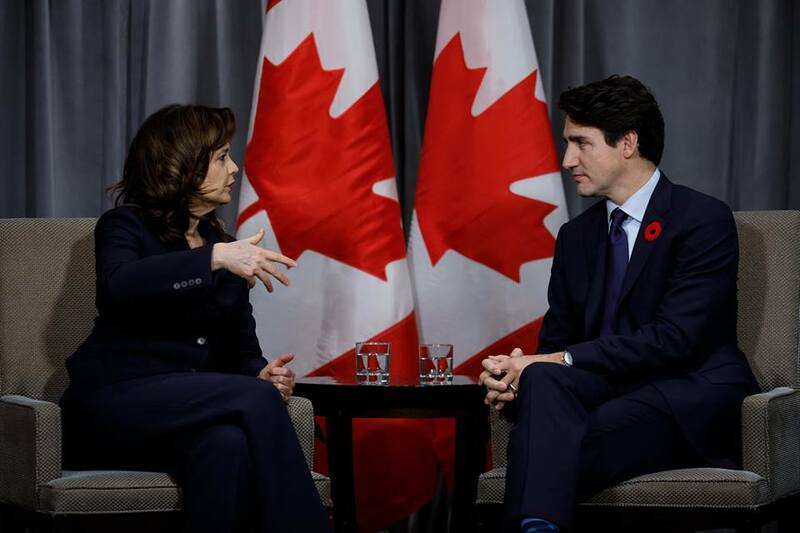 Why has Trudeau expended so much political capital and CAN$4.5 billion of national revenue on expanding a pipeline – particularly one that actually has a pretty shaky business case? If his government is vocally committed to action on climate change, why is it hell-bent on digging up and sending yet more of our high-carbon, oil-sands bitumen out to be burnt? This line of questioning has turned the gaze of many inquiring minds toward examining the power of the fossil-fuel industry in Canada’s national politics. Is the industry on its own powerful enough to drive federal policy, even when that policy clashes with highly-publicized commitments on climate change? Ultimately, though, the flow of bitumen relies on the flow of finance. If we’re thinking about the power of fossil-fuel producers, we have to contemplate how that interacts with the power of finance. Canadians, of course, are not alone in pondering their governments’ dissociative rhetoric, policy, and practice. Governments around the world (with the obvious exception in the White House) proclaim their commitment to fighting climate change, while continuing to subsidize fossil-fuel production to the tune of $445 billion per year. Thus, the dissonance between proclamations and practice on climate is a global phenomenon. If you read the newspapers and blogs on climate politics often enough, and for a long enough period, this jarring dissonance eventually resolves into a discomforting pattern. Outright denial, once the favoured elite option, and still held in reserve as a fallback position at the centre of global capitalism, has given way to a new elite consensus. ‘Climate change is happening; “humans” are the main cause; it’s serious; it will have major costs.’ From there, however, the dissonance begins. Because in practice, while NASA will spend millions carefully tracking rates of ice loss in Antarctica, exclaiming over its ‘surprising’ acceleration into 2018, and while insurers tot up the mounting losses to property and life arising from flood and fire, these meticulously catalogued mileposts on the road to catastrophe seem unable to generate a change of course. We watch carefully, we acknowledge, we carry on as usual. It’s not as passive as it sounds. While there is a well-documented form of everyday, socially generated denial in which most people in the industrialized world engage – turning to our screens as a distraction, and jumping in the car to pick up the groceries – there is also a less documented process through which power is brought to bear in reinforcing business as usual. Socio-ecological systems have to be actively reproduced, and central to that is political work. Barring those in the immediate orbit of the Trump White House (not an unimportant exception, it has to be acknowledged), most of the people hanging around the ski resort of Davos every January for the World Economic Forum will express their deep concern about climate change, and then go on to do whatever is possible to prevent a meaningful collective response to the civilizational crisis it presents. They will dig up the fossil fuels, haul them, and burn them. They will build the infrastructure that locks us into burning fossil fuels for the next half-century. They will thwart tax measures that could help fund a transition to renewable energy. They will encourage urban sprawl, expand cattle production, grow palm oil, build server farms, and so on. And they will finance all of the above, keeping capital flowing into projects that exacerbate what they themselves describe as the ‘greatest threat to civilization’. There is, of course, a very different universe of climate politics, where people gather, build blockades, lie down in front of machinery, glue themselves to buildings, get attacked by dogs, and come back. This is likely to the be only political force capable of preventing catastrophic climate change. 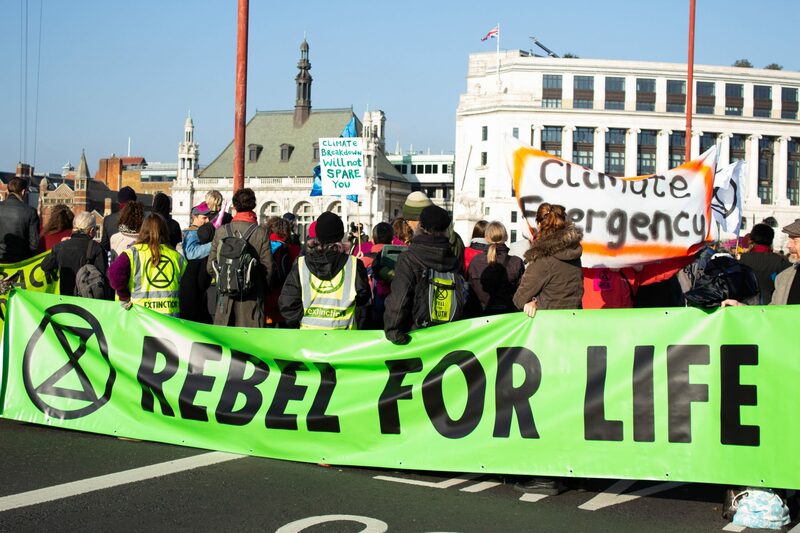 These movements, like the emerging Extinction Rebellion, are rooted in a much more realistic assessment of what climate science means for policy. Their effectiveness will ultimately lie in their capacity to identify who or what is responsible for perpetuating fossil-fuel extraction, which requires focusing not just on fossil-fuel corporations, but on the whole commodity chain. This way of approaching the question – looking up and down the commodity chain – leads us to think less in terms of the power of a specific industry, and more in terms of class power. Activists and academics alike – particularly those of us with an anti-capitalist orientation – sometimes tend to think of capital as a united force. However, that’s not always the case, and sometimes we would be wise to think of capital in the way that Adam Smith understood it, as a social system characterized by both competition and cooperation. Nicos Poulantzas was also onto this, although he framed it in the terms bequeathed by the Italian Marxist Antonio Gramsci, relying on the concept of hegemony. Hegemony, he argued, was just as much a problem for those within the upper echelons of capitalism as it was for the system as a whole. Capitalists don’t always see eye to eye, so in order to avoid a fragmentation of capital into a set of squabbling factions, a hegemonic ‘power bloc’ was needed to unify and express a class interest. For some time, people have seen finance as fulfilling this hegemonic role, since the nature of its business is materially tied to profitability across the system as a whole, rather than within a specific segment of it. As political pressures mount from the other side of the class divide to take action on climate change in order to stave off an ecological and humanitarian crisis, Poulantzas’ ideas suggest that in order to keep the state from bowing to these pressures in ways that threaten capital, and to maintain its control over state action, capital must be as unified as possible. Climate change, though, presents capital with a problem of ‘interest aggregation’ – a process usually thought to plague working-class organization – in that climate policy is likely to force capital to weigh its different interests one against another, and the development of a unified, class-wide policy preference is likely to create winners and losers. So, the different relationships between capital and climate change suggest a problem for the formation of a capitalist class-based, hegemonic response to climate change, which means a potential opportunity for social forces arrayed to prevent it. The more fragmented is capital, the higher the chance that oppositional social movements will be able to influence government. Perceptions and realities of risk and opportunity for the accumulation of value vary highly across industry sectors. We can guess how fossil-fuel corporations would like to respond to climate change. Their business plans certainly spell it out in no uncertain terms, even as they proclaim their support for the Paris Agreements. Their intention is to continue producing on their existing fields, and exploring for more, even as the reserves they are currently producing will shoot us well past the 1.5 and 2 degree marks. They want no policy to impinge upon the profitability of tapping into fossil reserves. However, the interests of financial firms are more ambiguous, and in fact might be contradictory over a sufficient time horizon. Exposure to risks such as potential expropriation, stranded assets, sudden and catastrophic property losses due to extreme weather, liability, or loss of brand value resulting from negative public image, together with specific loan portfolios and asset holdings, create a complex mix of incentives and interests for financial firms. Figure 1 comes from the Bank of England, and attempts to highlight the increasing dangers to financial stability posed by extreme weather. Financial capital – banks and insurers in particular – has been more vocal in supporting greenhouse gas (GHG) emission reductions, and some institutional investors have criticized governments’ failure to take climate change seriously enough. Insurers occasionally proclaim how much more they are paying out in property and life claims resulting from extreme weather, and prominent financial institutions, like the Financial Stability Board or the Bank of England have been aggressively pushing financial firms to disclose their climate-based risks to investors. Their prospects of profit are less exclusively tied to continued fossil-fuel production, they have other options available for profitable investment, and they face potentially severe risks from climate change. Some have looked at this picture and suggested that finance, a politically heavy-hitting business sector, has a ‘material interest in decarbonisation’, and is thus a likely champion of aggressive climate action. However, finance also creates and remains embedded in a complex set of relations with the fossil-fuel industry, which muddies the picture considerably. While their interests may appear to diverge from those of the oil, gas, and coal companies, a closer look at how companies are linked suggests that in the absence of serious pressure, finance is an unlikely candidate to take the lead on building a decarbonized economy. Scholars in the tradition of C. Wright Mills and John Porter reveal the ways through which capital attempts to overcome ambiguous or conflicting interests, to try to build or impose class-wide unity. These strategies rise on the foundations of identifiable networks – structures that enable capitalists to share perspectives, to develop a class consciousness, and to talk through differences. These might be structural – like shared ownership; they might involve institutions explicitly for this purpose – like trade associations and policy groups; but they might also be social – golf clubs, churches, arts and cultural institutions. The degree to which finance capital is connected to fossil-fuel capital through these kinds of structures has implications for the political interventions and the orientation of financial firms’ efforts on climate change. Two of the more obvious ways that firms might come to share perspectives on problems and policy are through director interlocks, and through both holdings and lending. In Canada, a disproportionate amount of political power is being brought to bear to defend and advance the interests of fossil-fuel companies in the face of rising public awareness of climate change. Why this is so becomes clearer once we see that financial corporations are deeply embedded in networks of ownership, credit, and board interlocks with the fossil-fuel sector. Data on bank lending is difficult (that is to say, expensive) to get. Thankfully, the Rainforest Action Network (RAN) has been putting together annual reports on global lending to ‘extreme’ oil projects, using a tactic of ‘naming and shaming’ that sheds light on which corporations are financing climate catastrophe. Bank lending shifts the landscape of risk for financials by creating a shared interest in the perpetuation of fossil-fuel extraction and transportation. Many of the projects they finance are long term, which gives them an interest in continuing oil and gas production well into the future – particularly in the tar sands, where most of the capital costs are sunk. Once the facilities are built, they cost relatively little to operate, so the incentive is to keep producing, even when oil prices are low. Canada’s banking system is dominated by five large chartered banks: The Royal Bank of Canada (RBC), Canadian Imperial Bank of Commerce (CIBC), Scotiabank, Toronto Dominion (TD) and the Bank of Montreal (BMO). All five are among the world’s top 20 financers of RAN’s extreme oil and gas, with RBC ranking second in this odious league table. RBC alone provided over $26 billion from 2015 to 2017 to finance extreme oil and gas extraction, up massively from the year before, in significant part to finance the purchase by Canadian firms of tar sands reserves being offloaded by foreign multinationals. The five banks together provided $71 billion during this period. Most of this is for domestic oil production in the tar sands, for which the big five’s lending makes up a whopping 62% of the total. It is also noteworthy that this lending spiked hugely in 2017 compared to the previous couple of years, to $33.44 billion in 2017 from $15.57 billion in 2016. This is surely driven largely by the rebounding price of oil, but it also suggests that Canadian banks feel little fear of any political action that would result in the necessary transition away from fossil fuels. As a proportion on their total loan books, $71 billion over the past three years is not overwhelming, but it is significant. The biggest lender, RBC, for example, has had a net increase in its total outstanding loan portfolio of $107.3 billion. Its climate-change-inducing finance is just under a quarter of this value. The $71 billion total exceeds, by a considerable amount, all new capital expenditure in the oil sands for this three-year period, which the National Energy Board reported at $52.6 billion. While the finance for fossil-fuel extraction can come from retained earnings within oil companies themselves, or from share offerings, or from borrowing, the oil giants are increasingly dependent on bank finance. Since the price of oil collapsed in 2014, and given its slow increase subsequently, in-house financing has become more scarce, and as international financial institutions like HSBC pull out of new projects, Canadian banks will become an even more important source of funds. Financial corporations (including banks and asset management firms) are also linked to fossil-fuel corporations through their holdings. In Canada, this relationship is deep and wide. Major Canadian financial firms, far from being concerned exclusively with the ‘dematerialized’ realm of finance, are heavily invested in extraction and transportation of oil (and other natural resources). Most of their portfolios are dominated by inter-industry holdings – ownership stakes in other financial firms. At the top end, for example, just over half of RBC’s and TD’s holdings are in the financial sector. Outside banking, the financial holdings of firms like Fairfax Financial and Power Corporation of Canada make up around 40% of their portfolio. However, while the ‘carbon intensity’ of financial firms’ holdings varies, energy (composed almost entirely of oil and gas extraction and transportation) is also a very substantial element, meaning that they have an active interest in, and an upbeat analysis of, the future profitability of fossil-fuel firms. Figure 2 shows each financial firms’ share of energy holdings, as a percentage of the total. Ownership of the fossil-fuel industry goes beyond Canadian borders. Of the top 10 owners of the fossil-fuel industry in Canada (measured by their share of total Canadian fossil-fuel revenues), only half are Canadian. The biggest gun is US-based ExxonMobil, which controls about 6.6% of total revenues. However, in addressing the question of power within Canadian national politics, we need to keep an eye on the extent to which the interests of Canadian corporations in finance and fossil fuels converge. Figure 3 shows which fossil-fuel companies are held by which Canadian financials. Each line in the figure represents a financial firms’ holding of a fossil-fuel firm. The top row of nodes shows the big five banks. Figure 3: Holdings Network, Finance and Fossil Fuels Corporations in Canada, 2018. The bottom shows Canada’s largest non-bank financial corporations. The middle three ranks are all fossil-fuel corporations – the top rank shows the ‘Big 8’ companies most active in Canadian tar sands production and transportation: Imperial Oil, Cenovus Energy, Canadian Natural Resources Limited, Suncor, and Encana from the production side, and TransCanada, Enbridge, and Pembina from the transportation side. 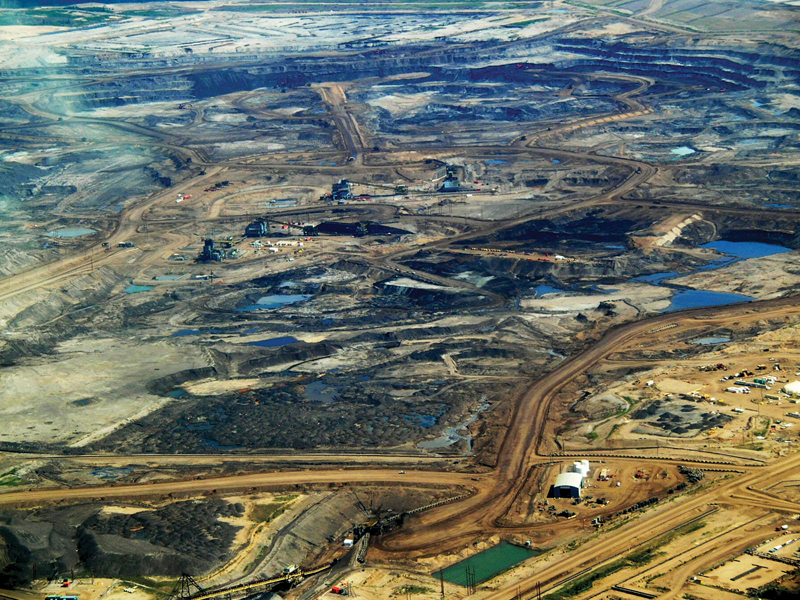 CIBC, RBC, Scotiabank, BMO, and TD Bank (every major Canadian chartered bank) have holdings in the Big 8, and four of the five big banks’ top three energy holdings are Canadian firms active in the tar sands (TD Bank is the exception, which holds significant shares in BP and ExxonMobil). Pipeline firms Enbridge and TransCanada, and extractive corporations Suncor and Canadian Natural Resource Limited, are the most heavily owned by financials as a proportion of the financials’ portfolios. The middle row shows the most broadly owned foreign firms. The fourth rank shows the three miscellaneous fossil-fuel companies owned by a minimum of five financials. The nodes of the financials are scaled to their energy holdings as a percentage of their total portfolio. At the bottom are five of the largest, connected asset management firms. Fairfax does have holdings in the fossil-fuel industry, but they are distinct from the most tightly networked companies shown here. What Figure 3 suggests is that there is a broadly shared interest in buffering the fossil-fuel industry from policy that might detract from its profitability – particularly policies that respond meaningfully to the fact that much of Canada’s fossil fuels will have to be left in the ground in order to avoid climate disaster. While investment in the continuing operation of the tar sands varies, it is a significant share of holdings across the board (and very high for both CIBC and RBC, for which energy is the second biggest sector in their portfolios, after finance). Loans and holdings reveal a direct financial stake in the perpetuation of the fossil-fuel economy. Capitalists are also embedded in networks that are important for building unity because they facilitate information exchange, communication, and the development of shared discourses, understandings, and policy positions. One of these networks is composed of shared directorships. Corporate directors will sometimes sit on more than one corporate board, acting as link between the corporations. In discussions about policy, legislation, or regulation, for example, a director on a bank board who also sits on the board of a pipeline company can act as a conduit, transferring information, perspectives, or preferences from the pipeline industry to and from the banking industry. These conduits provide another foundation for the development of a class-wide perspective on key policy issues, including on climate and energy policy. To get a picture of what this network looks like, we start with a core group of oil and gas majors and pipeline companies with operations in Canada with revenues over $350 million in 2017, which is the revenue of the last-ranked firm on the FP500 (Canada’s largest 500 corporations). This delineation of the network captures all of the 15 so-called ‘carbon majors’ in Canada, which collectively accounted for 63.5% of total sector revenues in 2014. To this, we added the finance and insurance majors headquartered in Canada with minimum revenues of $350 million, to form the core of the finance/fossil-fuel network of 88 corporations. We then collected the list of directors for each corporation, including their other current board affiliations. Our network thus grew from the core to include ‘first order’ neighbours – corporations, regardless of revenue, industry classification, or country of operation, tied to core companies via a shared director. 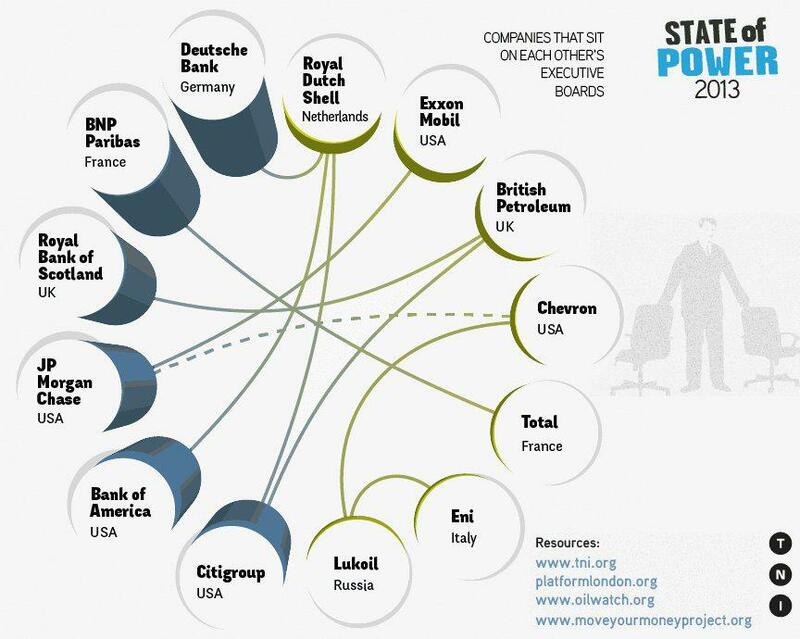 This maps the network of ties between and within fossil-fuel and financial corporations. The total network comprises 1,551 corporations, connected by 2,102 shared directorships, and just 582 individual directors form these ties. 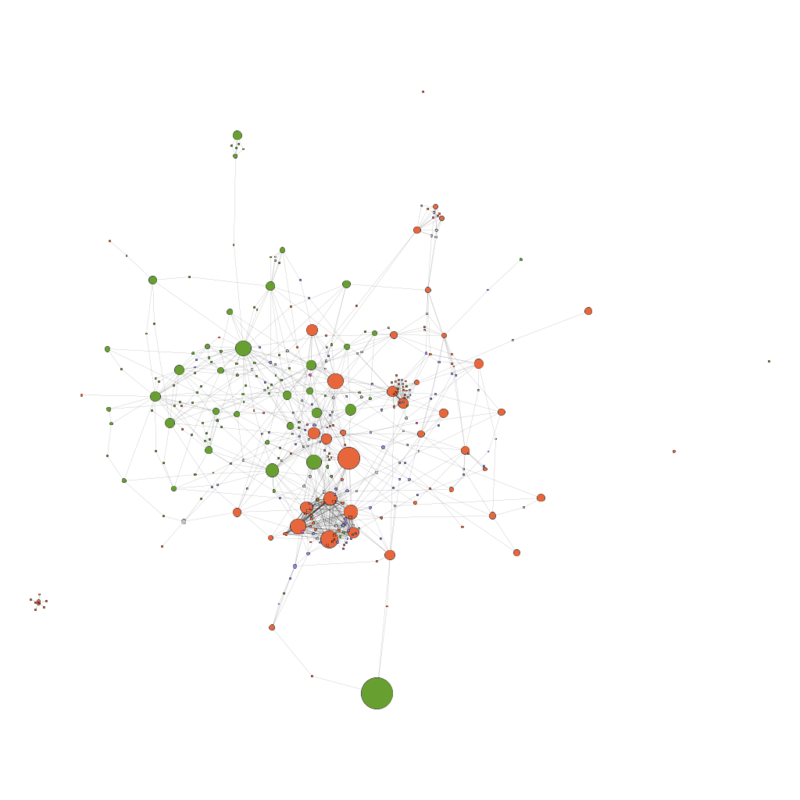 Eliminating firms with only one link (so-called ‘pendants’, which don’t serve to increase the overall connectivity of the network), we’re left with a network of 362 corporations, connected through 915 shared directorships. Figure 4 gives an idea of the complexity and connectivity of the network. We have excluded the labels for the individual corporations to make the map more legible. Figure 4: Fossil Fuel and Finance Capital, Director Interlocks of firms with two or more ties. Financial firms are show in orange. Fossil-fuels firms appear in green. The size of each node is proportional to its number of ties in the total network. The algorithm used for the visualization clusters nodes according to how closely tied they are in the network. A fairly clear division is apparent, with firms from each sector clustering with their own. That is, the degree of connectivity within each industry is much greater than it is between the two industries. 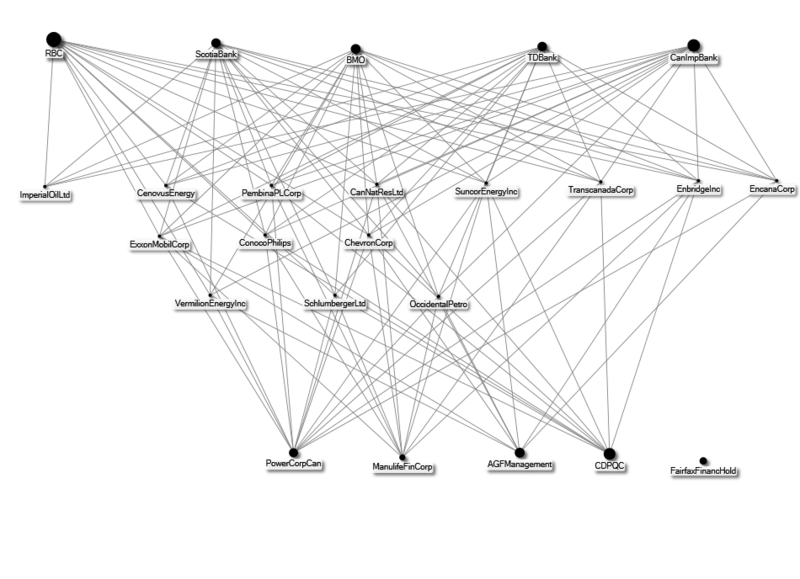 Here we include only the companies in the ‘connected component’ of the graph. There are a few smaller ‘islands’ (small clusters of companies not connected to the rest of the network), most centring on Quebec-located financial firms, or other regionally-based credit unions and insurance cooperatives. However, 98% of the firms in the network form a connected component. While Figure 4 confirms that corporate directors tend to stay within their ‘home industry’, finance and fossil-fuel capital in Canada are stitched together by a core group of very large and powerful companies. In order to give a clearer picture of the who’s who in our network, in Figure 5 we only include the most heavily connected companies with six or more ties. We lose some visible ties by doing so, and under-represent the reach of the core companies, but it visually clarifies the group that works to tie these two sectors together. A few features are worth mentioning in the context of how power and influence flow through the network. First is the group of important ‘border’ or ‘bridging’ firms along the centre of the vertical axis dividing the two industries. The carbon majors in Figure 5 include Cenovus Energy, Teck Resources, Suncor, Encana Corporation, Enbridge Inc, and Transcanada Corporation. The finance majors include Great West Lifeco, Power Financial Corporation, Brookfield Asset Management, and Manulife Financial Corporation. The five major Canadian Banks are also present: Toronto-Dominion Bank (TD Bank); Canadian Imperial Bank of Commerce (CanImpBank/ CIBC); Bank of Nova Scotia (ScotiaBank); Royal Bank of Canada (RBC); and Bank of Montreal (BMO). These firms act to channel perspectives and information between industries. This connected cluster of companies includes most of Canada’s major financial corporations, and the vast majority of its carbon majors, each responsible for the bulk of revenues in each sector. These collectively form the muscle and blood of the Canadian fossil-fuel industry. They are closely connected through board interlocks, and provide the necessary focal point for the generation and diffusion of shared interests, understandings, and preferences on policy matters, including on climate and energy policy. In other words, they provide the foundation for the development of capitalist-class unity on Canadian climate policy. Second, the very tight cluster of financial corporations towards the bottom is composed of firms owned by the Desmarais Family Residuary Trust. The family’s straightforwardly named Power Corporation is a financial giant in Canada, and a significant shareholder in Total S.A., which was not long ago a major player in the tar sands. The Trust is a politically and economically well-connected family corporation with vast channels of influence. The corporate patriarch was Paul G. Desmarais, who died in 2013. He was tightly connected to the ruling Liberal Party of Canada, having been a key advisor to the former Prime Minister Pierre Trudeau (the father of the current Prime Minister). His daughter-in-law is former Liberal Prime Minister Jean Chrétien’s daughter (via André Desmarais, who sits on many of the Trust’s boards). Hélène Desmarais, wife of Paul Desmarais Jr., is President of the board of the influential and libertarian-conservative Montreal Economic Institute, a champion of hydrocarbon development in the province of Quebec. Pierre Trudeau, along with former Conservative Prime Minister Brian Mulroney, both served on the Board of Power Corp, as does the former Canadian Ambassador to the US, Gary Doer, whose primary job was to sell the Keystone XL expansion to state governors and members of Congress. Doer was a terrier in his efforts to shill for TransCanada’s Keystone expansion, expressing brash confidence in 2012 (“I will bet a six-pack that it is going to happen”), doubling down on empty promises that the Canadian government was ‘committed to further action including regulations for our oil and natural gas sectors’, and casting aspersions on the Environmental Protection Agency’s assessment of the proposed pipeline. Finance is often understood as a conflicted industry in the context of climate change, and thus as a potential force for positive change. Financial firms face risks arising from climate policy large enough to threaten ‘severe financial shocks and sudden losses in asset values’. As such, it has recently been subject to a discourse of climate-based ‘material risks’ and the need for disclosure of such risks. However, our research shows that in Canada, the financial industry is tightly bound to the fortunes of the oil and gas industry, which is probably true elsewhere. As long as such bonds hold, we can expect that their considerable political power will be brought to bear, where and when necessary, in defence of the catastrophe-inducing fossil-fuel economy, and in opposition to ideas of just transition. To the extent that finance is responding to climate change in their corporate practices, it appears to be less about mitigation, and more about adapting to ensure continued profitability through processes of ‘de-risking’. When it comes to climate change, capital’s definition of ‘interest’ has been developed through the lens of risk. Risk can be regulatory (e.g. government might require emissions reductions consistent with the Paris Agreement), geophysical (extreme weather or other changes to the climate system will actually cost money), or reputational (corporations might suffer damage to their brand value or other revenue streams as a result of people holding them to account for facilitating the end of civilization as we know it). The emerging response of capital to climate change has been to translate its often brutal, qualitative dimensions into streams of probability and cost and then to develop minimizing strategies through such comfortable corporate means as public relations, lobbying, insurance, supply chain management, and portfolio management. The fact that climate change enters into the ledgers of capital does, however, open possibilities for activism. As evidenced by organizations like Market Forces and the Unfriend Coal movement in Australia, by the leverage opened up by industry-insider institutions like the Task-Force on Climate Related Disclosures which advocate for greater transparency on climate-related risk, and by bank-targeted divestment movements spreading across countries, activism can change the landscape of risk faced by financial firms. Most banks in Canada, for example, derive significant revenues from residential loans, making them vulnerable to popular divestment movements. As Naomi Klein laid out in No Logo, risks to brand value are taken seriously. This provides an opening to pry fossil fuel and finance capital apart. Fossil-fuel companies are less likely targets, because their entire business model and corporate structure is wedded to digging up oil, coal, and natural gas. Finance is more precipitously positioned. Its calculations of risk could tip with sufficient citizen-led pressure. Indeed, we see some kinds of industry responsiveness already: internationally, some banks are pulling out of fossil-fuel investments and lending under social pressure. Financial firms and consultancies are increasingly busy developing tools and algorithms that take as input human and ecological disasters like flooding, fires, drought, hurricanes and typhoons, and that produce as output indices of potential lost profit. They are also developing tools to minimize and spread this risk. However, there is a broader danger here in engaging with calculations of risk that brings us back to the deep power of the financial industry. Risk is fundamentally a quantitative concept expressed under capitalism almost exclusively in terms of price. This framing of climate change is working its way more deeply into public discourse, political processes, and activist strategies. But it is fundamentally the language of capital. Prices are the only thing that can make climate change visible and actionable to capital. But this framing creates huge blind spots. Just to take one example, floods of the same magnitude in Houston and in Bangladesh become, in the lens of risk management, drastically different. 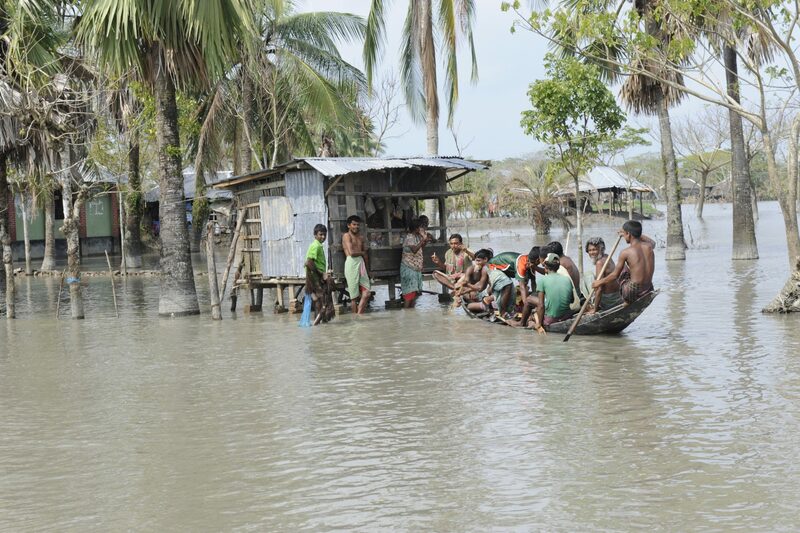 Although many more human lives are likely to be far more devastated in Bangladesh, the Houston event is a much greater financial risk because of the value of insured property and life, and the value of economic activity and wages foregone. It measures the implications of climate change in terms of corporate risk, financial stability, and GDP foregone. For most people, however – especially in the global South – climate change is likely to be lived through increasing misery, dislocation, disease, and death, which will never appear in any accounting books, in any form. It is only by resisting the total incursion of ‘risk management’ and other market-based languages of price into popular and political conversations that we will keep climate change in the longstanding registers of political protest. At stake in ceding ground to ‘risk management’ is our ability to talk about climate change in terms of moral responsibility for one another and for future generations, and in terms of justice that make everyone’s (and even non-human nature’s) wellbeing equal to everyone else’s, and to reclaim the fate of our planet by democratic forces in which everyone’s voice counts equally. Finance swings a big bat, and leveraging its clout for the goal of decarbonization is a tempting prospect. Getting finance to stop providing funds for fossil-fuel projects would indeed go a long way towards keeping carbon in the ground. However, we can’t rely only on the fact that banks might be invested in potentially stranded assets, or that insurers face rising costs as climate change begins to bite. The interests and perspectives of finance remain entwined with those of fossil-fuel corporations, and it will take significant action from activists to tilt their cost–benefit calculations on climate change. It will take a drastic increase in reputational and political risk to move finance away from the otherwise profitable fossil-fuel sector, in which they are highly embedded. In other words, the fragmentation of capital on this issue – crucial to our ability to push states into aggressive action – is not automatic. There is plenty of glue holding capital together. Fractures have to be created. This problem may be acute in Canada, but is likely to be true for many other centres of fossil-fuel production. An even more widespread aspect of the power of finance its ability to get us all to speak its language. Increasingly, politicians and even activists talk about climate change as a risk management (meaning risk-optimization) problem. There is power there, and risk is currently a convincing-looking weapon, since the potential costs of tipping over 1.5 or 2 degrees are so severe. But risk is fundamentally about trade-offs, and those trade-offs are always framed from a certain perspective. Rational risk management from the corporate perspective includes the possibility of trading away a liveable planet against (yet more) profit accruing to a tiny, wealthy minority. Mark Hudson is an Associate Professor in Sociology and Global Political Economy at the University of Manitoba. He is author of books on the political economy of wildland fire, fair trade, and the forthcoming Neoliberal Lives: work, politics, nature and health in the contemporary U.S.